The Marcy Stop: Music Fest Must-Haves + $300 Beso Giveaway! 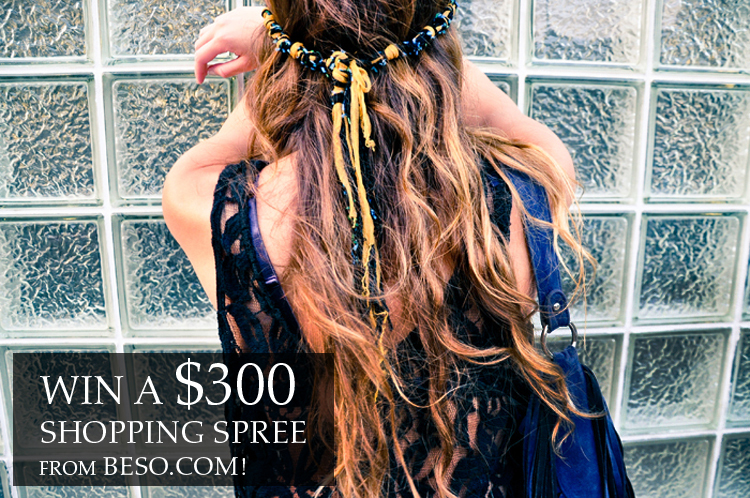 We are super excited to share with you guys that we've teamed up with Beso to give away a $300 Shopping Spree to one of our readers!! Yes, you read that correctly, $300! We're kind of addicted to the site so it's perfect that we're able to hook one of you up. We're not sure if Winter has finally given up, but regardless Lauren and I are already gearing up for one of our fave summer events: Governor's Ball. It's a three-day music extravaganza that this year might just have a better lineup than Coachella. (Yup, we said it.) So whether you'll be joining us there or heading to Coachella or another music festival sometime soon, in honor of the occasion we've created a full collection of festival must-haves on Beso to inspire you! Above are our fave looks that we plan on rocking the first weekend of June when, with any luck, we're soaking up warm summer rays while listening to a few of our favorite bands. For bonus entries follow The Marcy Stop and Beso on Twitter and/or follow us on Instagram @micolina_ and @heylogo. Be sure to mention your info in your comment so we can find you. I love those shorts! They're very cute! Great giveaway! love your giveaway. Cool collaboration! My collection is black and white which is one of my favorite Spring trends! This is a fabulous giveaway! Entering now! Following both on Twitter (@hollymarie076). Beautiful items and a great giveaway! I love that flower crown! I've always wanted one of those! Such a great giveaway. I've always wanted a flower crown! And I love the bags! Great giveaway! I am loving everything. I've liked both pages on FB as Jan Santos. I've liked both pages on FB, and I've also signed up for an account at Beso.com! Liked you & beso on fb. I created account on Beso. I follow The Marcy Stop and Beso on Twitter! I follow on Facebook (Cassie Korando). I am follow The Marcy Shop & Beso on Twitter! This is such a fun giveaway! I love beso! And I like you both on facebook! Thanks so much! I LOVE BESO. srsly. I'm addicted to this website now! TYSM! I like both pages on facebook as Thomas Murphy and I signed up for a beso account. I also follow both on instagram as rounder9834.